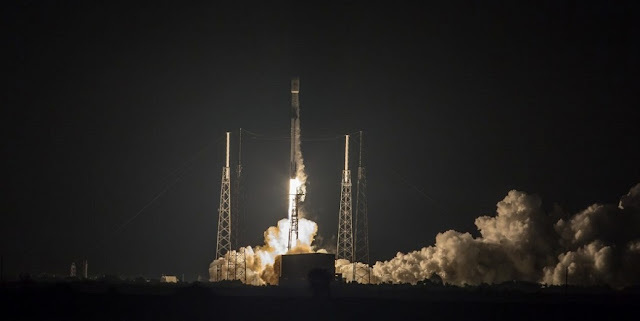 SpaceX’s rapid-fire launch cadence continued July 22, 2018, with the early-morning launch of the company’s second Block 5 Falcon 9. The rocket placed the Telesat-owned Telstar 19 VANTAGE communications satellite into a geostationary transfer orbit. Liftoff from Cape Canaveral Air Force Station’s Space Launch Complex 40 took place at 1:50 a.m. EDT (05:50 GMT) at the opening of a four-hour launch window. The weather was predicted to have a 60 percent chance of acceptable conditions with evening rain showers lasting longer into the night than typical for the area. However, thick and cumulus clouds stayed far enough away from the area to allow for an on-time flight.